Today has been something of an off day. You know the type I mean. Not a bad day just a day where life seems a little out of whack. As if things were not quite the way they ought to be but close. Some might tell you there is no remedy for such a day. That the only course is to ride it out and wait for tomorrow. But I find that the best course is to grab some comfort food and relax with a book or a good movie. 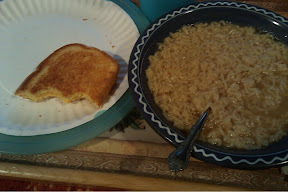 For me comfort food means grilled cheese and ramen noodle soup. Growing up this combo was Mom's prescription for kids who didn't feeling well but weren't really sick and for warming up after a day playing out in the cold. Or at least that's how I remember it and that works for me. and hopefully tomorrow will work for me too. I just hope it doesn't ask for a raise.